Grey split leather B-Flex Rigger glove with heavyweight red cotton backing and safety cuff. 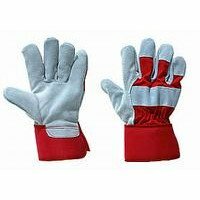 Good fitting large size with fleecy lined palm and thumb-face for added comfort. Very competitively priced yet maintaining consistent quality throughout. Conform to cat II EN388 4 1 4 4.